Eventually, I get around to things. 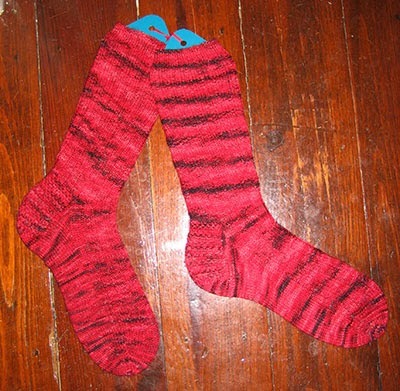 A couple of posts ago, I told you about receiving yarn for a pair of socks, and promised an FO post for them. This is the promised post, and it is extremely overdue, as the socks are my last FO of 2014! Back in August, when I opened up the package containing this yarn, The Tim said, "That yarn would make great socks for me." I am pretty sure I gave him a dirty look, but I do remember saying, "Well, I'm not sure this is sock yarn," to which he replied, "You told me that pretty much any yarn can be sock yarn if you want it to be." Great. Once out of a bazillion times, he actually listens to what I say! Anyway, fast forward to October 2014. Our anniversary was at the end of the month, and The Tim is a hard person to buy a gift for, because if he likes/wants something, he'll generally just go ahead and get it. Which is nice for him, but leaves me racking my brain for ideas. So I decided that I would go ahead and use the yarn to make socks. I had a whole month, no big deal. Except that at the same time, I decided to make a pair of Halloween socks for myself. Still, it all seemed quite doable. And I got started on both of them and was happily knitting along. Then life and work intervened. After a couple of weeks, I realized that it was likely that neither pair would be even close to finished before the end of October. So I put the Halloween socks aside, and decided to concentrate on the Kidney Socks, because The Tim's birthday is in November. Then they became a Christmas gift, since it was clear they weren't gonna be finished by his birthday. 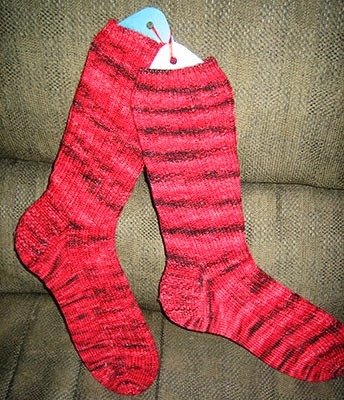 I zipped along, and then just near the end of the second sock, my osteoarthritis started acting up. So I had to take about a week off from knitting, though I could do other holiday things, so it was fine that way. Well, the good news is, the socks were completed. Yep, at approximately 7:45 a.m. on Christmas morning, I finished grafting the toe of the second sock, wove in all of the ends, and popped them into a gift bad I had waiting. Modifications: Not anything major, I just decided to make the leg longer than the pattern indicates. I always feel that regular socks that are not knee socks are lower on the leg than I would prefer. So I added an inch and a half. The Tim reports they are comfortable, and that he likes the length. I love the way they turned out, and the yarn was just wonderful to knit. I'm glad that we both like them, because it was ridiculous how long it took me to make them! I was determined by December though, that one way or another, they would be a Christmas gift for 2014. Phew! In any event, it is Friday, so let's see what has pleased me over the past week. 1. Last weekend could actually be all five of these things, but I'll call it #1 here. We traveled home to West Virginia, and visited with lots of family. We had bought tickets to a concert that weekend for everyone who was interested, as a Christmas gift. So besides all the fun we had just being together, we got to hear Tim and Mollie O'Brien perform with the Wheeling Symphony. Tim and Mollie grew up in Wheeling, so it was a homecoming event. And it was fabulous. Plus they are a lot of fun. 2. Pittsburgh. We headed home last Thursday, and everyone else was arriving on Friday evening, so The Tim and I headed to Pittsburgh for the day. We went to the Frick Art & Historical Center, which neither of us had visited before, and then we had a wonderful ramen noodle soup lunch at a local noodle place. The perfect lunch for a cold day! 3. President's Day. We returned to Philadelphia Sunday evening, and it was soooo nice to still have a holiday on Monday, and not have to go back to work right away. 4. Hats, scarves, mittens, socks. They make going outside in the uber cold possible, and mean that cabin fever is less likely to occur. 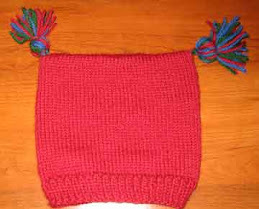 Of course, hand knits are the best, but any that are warm make the cut. 5. Soup. It would be hard for me to count the ways I love soup - pretty much any kind. But I am particularly fond of potato soup and mushroom soup. I also tried this recipe (vegetarian-ally adapted), and it was not just easy to make, but extremely yummy! It will definitely go into the soup rotation. So I have to say that even though it's been cold, and I have not felt particularly motivated to do much of anything at all, it's been a good week for all of us. 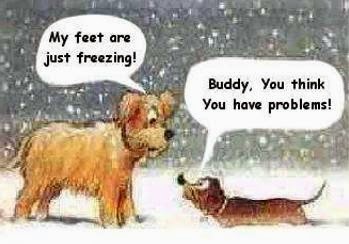 I hope your week has gone well, and that you are keeping warm. Last month, I showed you a pair of socks that a blog friend knit and sent to me when I was recovering from surgery in July. That post is here, in case you didn't get to see it. As I mentioned in that post, receiving those socks was one of the things that made me feel so happy while I was otherwise feeling awful. Lorraine is not the only blog friend who took the time to be thoughtful and let me know someone was thinking of me and wishing me well. Amazing. I have been reading Lorette's blog for years, and we have become really good online friends. We have a common love for wine and cocktails, knitting, food, music, and reading, just to name a few things. Through Facebook, her husband John has also become a friend. So when a package arrived with their return address, I was really curious to see what might be inside. I opened it, and it was a gorgeous skein of Eidos yarn from The Verdant Gryphon. The colorway? The Kidney Heist! Let me tell you, The Tim and I got a BIG laugh out of that - and it hurt me to laugh! The Tim almost immediately said, "That would make great socks for me," and I said something to the effect of, "Excuse me?" Fast forward to last October. Our anniversary was coming up, and The Tim is a really hard person, present-wise. He usually buys things he wants for himself. So I decided to actually go ahead and use "the kidney yarn" (as we called it) to make him a pair of socks - I mean, it's the only thing he had actually requested. Again, how lucky am I to have a friend like Lorette, who - even though we have never laid eyes on one another, or even spoken on the phone - sent me not just beautiful yarn, but yarn with a colorway name that was a) appropriate, and b) hilarious? I still find it astonishing that she took the time to send it to me. Thanks, Lorette and John! You gave me a happy feeling and a good (if somewhat painful) laugh at a time when I needed it more than just about anything else, and I will always remember your kindness. Kindness is never a bad thing. Today, is of course, most famous here in the United States because it is Groundhog Day. If Punxsutawney Phil sees his shadow, there are six more weeks of winter. Seems to me that Phil can't help but see his shadow, since TV stations cover the "official" event, and those lights would make anyone see their shadow, right? I know a lot of people who get really worked up by the whole thing. I enjoy Groundhog Day, because I think it is just one of those fun days on the calendar. I don't really care if Phil does or does not see his shadow, because winter doesn't seem to pay much attention to anyone's calendar, though it technically ends on March 21. Speaking of the day, "Groundhog Day" is one of my favorite movies. I love the part where Bill Murray says, "Don't drive angry, Phil." Today is also the birthday of James Joyce. I have only ever made it through "Dubliners," which I love, but The Tim can pretty much recite a lot of his work. And he has actually read "Ulysses" all the way through more than once. What??! So even if it is a Monday, and the weather (at least here) is dreary and cold and wet, I like knowing that there are at least four things that make today noteworthy. I hope the rest of the week is good for all of us. Onward and upward, right?